Sneaky Art Book Review and Double Giveaway! When we get right down to it, most of us create so we can share…smiles, joy, and beauty. Quick, easy crafts not only feed our desire to create and spread smiles, they also relieve stress by giving our analytical mind a break. Today I’m sharing a little book that makes it oh, so easy to sneak a bit of art time into your day—no matter what your age. The book is Sneaky Art by Marthe Jocelyn. I’ll be passing my copy on to one lucky winner–along with an extra prize—but first, let me tell you about the book. 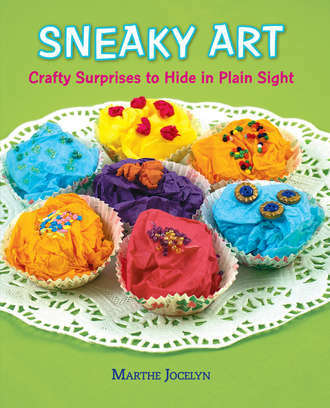 Sneaky Art: Crafty Surprises to Hide in Plain Sight is intended for ages 8-12 but appeals to sneaky artists of all ages. The projects are inexpensive and easily adaptable for large groups, making it a good resource for teachers, but the true beauty of the book lies in the underlying lessons in conceptualization and material re-purposing. For instance, can you make a boat using only the items in the recycle bin? Jocelyn uses wine corks or milk carton bottoms…what else could you use? What can you do with cupcake papers other than cover cupcakes? How about making them into fortune cookies! Each of the twenty-four projects in Sneaky Art are presented in a simple format listing materials needed, craft instructions, suggestions on where to “sneak” your art, and pictures of the finished pieces in their “sneaky” locations. The author offers clear instructions that “Sneaky Art is not mean, defacing, ugly, hurtful, messy, or permanent. Sneaky Art is not graffiti or marking up someone’s property. Sneaky art is funny clever, thoughtful, subversive, playful, and surprising.” Jocelyn even suggests going back to the scene of our “sneak” and retrieving our art if it is still there. To this I will add my own suggestion that any art placed outdoors be created with good stewardship in mind. We don’t want to create litter, and we don’t want to endanger any wild life. So, any paints should be non-toxic. Do not use thin threads or fishing line as they can wrap around the feet of birds and small animals causing injury. Do not use colored beads or fake berries as birds may ingest them and get sick (or worse). Would you like to win a copy of Sneaky Art? Details on how to win today’s special double giveaway are at the end of this post. For young artists, tricksters, and crafters, here is a hip, friendly how-to manual for creating removable and shareable art projects from easily found materials. The sneaky part is in the installation! Each work of art is custom-created for display in public places — a tiny cork-bottomed boat in a public fountain, a plate of tiny paper cupcakes on your teacher’s desk, a penny left on the ground for a stranger, a funny message left on your mother’s bathroom mirror, and more. This utterly unique guide — part craft book, part art-philosophy — offers a stylish and sweet “made-you-look-twice” spirit of fun meant to put a smile on the faces of strangers and loved ones alike. Marthe Jocelyn spent her childhood in Toronto reading books and putting on plays and circuses in her backyard. Marthe has a long string of jobs: theater usher, cookie seller, waitress, photo stylist, even toy designer before she finally settled on writer. She currently lives in Ontario with her daughters Nell and Hannah. As part of the Sneaky Art virtual book tour through Women On Writing, I am offering a double-prize package consisting of my hardcover, review copy of Sneaky Art and a Rainy Day Art Pack by Marthe Jocelyn. 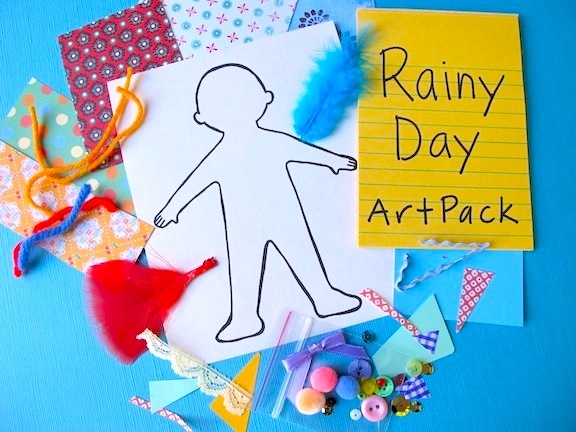 The Rainy Day Art Pack comes with a body template and a selection of scraps for crafting (decorative paper, pompoms, feathers, yarn, buttons, etc…) Just add glue and scissors! More fun than paper dolls (remember them?) Where will this little character end up? He/she might become part of a collage…or even take part in a “sneaky art” caper! Leave a Comment: Tell us about a time you took part in a sneaky art caper OR tell us about something wonderful you or your child created with re-purposed items OR tell us why this book appeals to you. Make sure your email address is either in your profile or included in your comment so I can get in touch with you! Visit A Ponderance of Things on Sunday, December 15th for more chances to win this Double Giveaway! Contest runs December 13, 2013 through December 21, 2013. One random winner will be chosen from all entries gathered on Museiddity and A Ponderance of Things. One winner will win the prize package consisting of one hardcover copy of the book, Sneaky Art, and one Rainy Day Art Pack. Items to be mailed separately. Winner to be notified by email and posted in a blog update.